Add a warm touch to your winter celebration by giving your guests these decorative and practical wine stopper favors to take home. 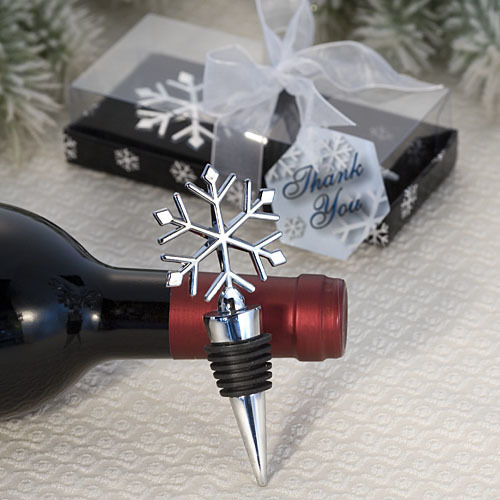 Each 4 .5" x 1.5" x.75" wine bottle stopper favor features a chrome stopper base wrapped with a black rubber gasket with a detailed three dimensional chrome snowflake perched at the top. Each wine bottle stopper comes individually packaged in a deluxe box with a clear top and black, snow-flake decorated bottom, tied with a white organza bow with an attached snowflake design thank you tag.